Here are some garden window pictures I’ve taken over the years, so that you can see the variety of things you can grow one one. Garden windows are quite an investment, but I think it’s more than worth it. It’s like having a small greenhouse on your wall. The one we have is in the kitchen and is facing North. However, since you get bright indirect light from all around the plants, and a sliver of direct afternoon light, I would say a north facing garden window will be the equivalent of a decent sized east or west window. You can also grow low light plant since they can’t get leaf burn, so it’s quite versatile. Also since the light comes from above the plants grow nicely and uniformly, and are displayed nicely, instead of being tilted away from you towards a window. Over the years my mom and I have grown many plants in this garden window and it’s interesting for me to compile and see all those pictures I’ve taken… These are only a small portions of them. On the right you can see episcia ‘Musica’, some other episcias in the background and a miniature african violet. Outside of plants that flower year round (what this website is dedicated too), I also collect and grow orchids, mostly miniatures, and exotic fruiting plants :). The picture below is of an Aerangis biloba flowering. Orchids grow very well on garden windows, especially in the kitchen where the humidity will be kept high, and since the window is protruding there will be larger daytime vs nightime temperature difference. That temperature shift seems to be quite essential in inducing flowering in a lot of plants, especially some orchids. Winter time when the day is short, you can still enjoy your garden window even if covered with a little bit of snow . This is a yellow flowered oncidium (Twinkle “Yellow fantasy’) and it contrasts the evening sky beautifully! There is a huge variety of plants you can grow..
Hope you enjoyed these garden windows pictures as much as I enjoyed taking them! Ceropegia woodii is a gorgeous small-leaved vine, that is commonly called rosary vine, chain of hearts, hearts on a string and so on, due to the heart shape of its cute waxy purplish-silver leaves. I love how this plant looks. It’s a great addition to any house plant collection. The plant is drought tolerant and doesn’t require much attention, it’s relatively easy to propagate, and I’ve used it in different flower arrangements. Like other ceropegias, the flowers are odd shape and interesting looking. Once this plant becomes well established it will flower throughout the year. The flowers are not that noticeable on the plant as they are not huge or contrasting to the foliage. They are still fascinating to look at, and either way it’s the leaves that are what makes Ceropgia woodii such a pleasure to grow at home. This plant is native to South Africa. It tolerates dryer air conditions and drought as well as occasional lower temperatures. There are different cultivars available with different size and leave variegation. Ceropegia woodii is a succulent plant that tolerates drought. Medium watering will be just fine for it, and if you forget to water it once in a while it will be no big deal. Do not overwater this plant, as it will rot away. Moist soil is ok, but soggy soil or leaving the pot soaking in water for a long time will kill your plant. I tend to let the plant dry out completely and then soak the pot in water until it gets moist, let it drain well and then repeat the cycle. I do water it more in the summer time. The higher the better, though it will grow and flower in part shade just as well. South west and east facing windows are ideal. I’ve grown Ceropegia woodii on a north facing window for a while to see how it does. It still grows well, but the leaves became lighter and spread farther apart on the stems, and the plant flowered less. North facing garden window is fine for this plant, where it gets very bright indirect light all day. If you take it outside in the warmer months make sure you slowly acclimated it to higher light levels to avoid leaf burn. It grows and flowers great at full sun exposure as well. This plant can tolerate lower humidity. If grown around high humidity loving plants, it will be fine as well, and you will just have to water it even less, since the leaves will evaporate less moisture since the air is humid. Cactus soil and cactus fertilizer work fine for this plant, though I’ve used generic potting mix with some sand, per-lite and peat moss as well. Ceropegia woodii likes well draining soil mix. Ceropegia woodii is very easy to propagate. It forms nods on the stems that you can root in sandy soil. The plant forms tubers as well and you can simply dig one out with the roots and repot it. It is a bit harder to propagate the plant from cuttings that don’t have nodes on them, but one way to do it is to get a bigger cutting and leave it a few days to dry a bit before potting it in moist sand, that will stimulate the need to grow roots and nodes. Once, on accident and I tossed the long stem cutting into a random flower pot with a big dracaena in it (did not even pot it or anything) and a week later I saw the ceropgia growing vigorously under the dracaena. It’s a lovely plant to have and very easy to propagate. Ceropegia woodii is great for hanging baskets and displays itself beautifully. It’s one of my favorite plants. I remember being so excited as a child when I saw one for sale, that my mom had to get it. I love the cute heart shape leaves and I love the color of this vine, it really stands out. If I didn’t have one already, I would prefer Ceropegia woodii for a Valentines day present, rather than cut flowers of chocolates. A great plant to have at home and since it’s not an overly aggressive grower you can easily pot it with other plants and do arrangements. Sinningia bullata is a fun and unique looking plant to have at home. It’s relatively easy to grow. The flowers are red/orange tubes, whose faces are dotted with darker red dots. What’s unique about this plant though is the white woolliness that covers the under-leaves, newly formed flower buds and flower stems. It’s interesting to look at and fun to touch. The bubbly green leaves make a nice contrast to the flowers, both color and texture wise. The colors are very bright and it’s difficult to take a picture that does this plant a justice. Unlike some other tuberous sinningias, Sinningia bullata does not go through period of dormancy, and it flowers year round. How much flowers you get depends on how well your sinningia has grown and how big it is rather than the season. It does tend to grow a bit leggy and you should feel free to cut off the old growth as there is always new growth sprouting from the tuber. In nature this plant is found on an island near southern Brazil called Florianopopolis. Sinningia bullata likes steep rocky cliffs, shade and moisture. This plant doesn’t seem to be bothered much by lower temperatures. You can still have it flowering in a cooler sunroom during the wintertime, but don’t let if freeze. Sinnigia bullata is a gesneriad, and there are quite a few other sinningias that are everblooming as well. I maintain the soil moist but never soggy, especially in the summer. Water less in the winter time, unless you are growing your plant in a warm location. It grows great with a hygrolon strip through the soil to maintain the moisture constant, and it seems to be fine with occasional drying out of the soil. This plant grows in part shade to shade. It seems to flower better when it has couple of hours of direct sunlight, making east and west windows ideal for it. It grows and flowers great on a north facing garden window, where it gets very bright indirect light all day long as well. Sinningia bullata tends to grow a bit leggy, so although you can easily grow it on a north window, I would not recommend it. It can tolerate lower humidity levels, but the leaves will curl up at the ends, so higher humidity will be better for this plant. I do not spray the leaves because they are hairy and don’t want water to stain them. You can use a humidity tray. Sinningia bullata needs well drained medium, so I use quite a bit of per-lite in my soil. Shredded tree fern fiber, and other epiphytic well draining medium would work as well. I use african violet soil with added peat moss and tons of per-lite for my plant and a bit of orchid potting medium, and is seems to work. It’s very important not to bury the tuber under the soil! You should let it protrude on the surface to prevent it from rotting and to allow new shoots to sprout freely. Before your Sinningia bullata reaches blooming size you can easily propagate it through cuttings. However, once you plant starts blooming that becomes very hard. I am currently trying to “re-set” growth by removing blooming stems. I hope after the plant start growing out new shoots I’ll be able to root some cuttings. Once your plant is blooming it will form seeds pots and you can propagate it through seeds as well, though it will take a long time for seedlings to reach blooming size. It’s a fuzzy and cute plant that really stands out among other plants. It’s has very bright green leaves and bright orange-red flowers that are a joy to look at. I highly recommend it! Sinningia bullata is a unique looking plant that stays relatively compact and once well established, never stops flowering! Cuttings from blooming sized plants seem to last forever in high humidity (they even continue flowering) but they stubbornly refuse to root. I love sinningias in general and there are many more everblooming ones that I would love to share with you :). Kohleria ‘Peridots Rolo’ is a cute kohleria hybrid with creamy pink flowers, and dark, contrasting, somewhat variegated foliage. Kohlerias come in many colors and sizes. They all have similar requirements, furry foliage and flowers . The flowers come in varietey of colors and patterns, but are all tubular, fuzzy and mostly plentiful. Kohleria ‘Peridots Rolo’ is a small kohleria, that stays under 12 ” (unless not enough light is provided, then it will get leggy and possibly taller). This plant flowers profusely (some kohlerias are mostly for foliage and flower less profusely). The pale pink flowers make a wonderful contrast with the darker foliage. If the light is lower the foliage is lighter green and the variagation can be clearly seen. A gesneriad, this plant has similar requirements to the african violet, though in my opinion, is a lot easier to take care of. Kohlerias produce rhizomes that creep though the soil. The grow offshoots and very quickly fill up a pot. Don’t worry if you dry out your plant: it can re-sprout from the rhizomes. They look like fat caterpillars, and based on the type of kohleria, come in different shades and sizes. This kohleria has light colored rhizomes that are produced in large amounts. This kohleria is easy to grow (like all of them), has medium watering requirements. It prefers to have the soil evenly moist, as well as bottom watering (like the african violet). Therefore it grows really well with hygrolon strip through the soil, pulling water up from a container under the plant. If its still in a small pot, a piece of yarn will do the same. Part shade to shade. This plant is relatively low light plant. It does like a little bit of a direct light, and can be grown on an east, west and north facing window. It grows and flowers well on a north facing window, especially if its a large unobstructed one, where the plant will get plenty of bright indirect light. It can be grown under lights as well. Kohlerias prefer higher humidity, though they can tolerate lower. They do not like their foliage sprayed. It will leave wilt spots on the leaves. Light, puffy african violet soil, or you can make your own mix. I add peat moss and plenty of per-lite or vermiculite to a generic potting mix, or add per-lite (more if you’ll be passively watering from the bottom of the pot) to african violet soil. This plant grows best if the soil is light, well-drained and aerated so that the kohleria can easily grow its rhizomes though it. Extremely easy to propagate! Kohlerias simply grow off shoots and you can pick out one out. You can also unearth some rhizomes or even a fraction of a rhizome. Kohlerias can be easily propagated though cuttings. In fact, you can have some cut flower in a vase and it will grow roots while flowering endlessly, unlike most plants where you have to remove any flowers or buds, so that the plant can form roots. You can also root a leaf, though that takes a lot longer. An awesome low light plant to have, that flowers endlessly with gorgeous interesting looking furry flowers. I absolutely love kohlerias! I have tons of them, though not all bloom non-stop, and will be listing other varieties soon. I love Kohleria ‘Peridots rolo’, because it is a smaller kohleria, compact and dense growing, and the the overall look of the plant is balanced and pretty. If you don’t have a kohleria at home, do yourself a favor and get some, you will not regret it. They are some of the easiest plants to grow in the home. In my experience a bit of cooler night temperatures make it flower even more heavily. Other than that there isn’t much to growing these beauties. Justicia brandegeana, formerly known as Beloperone guttata, is an awesome plant to have at home. Just like the name suggest, the flowers, or actually the bracts, are positioned in a way that it looks like a shrimp. The actual flowers protrude from the bracts and can be different colors, though usually are white with red markings. The cultivar “fruit cocktail” has yellow bracts and red flowers (not pictured in this article). There are varieties that have yellow bracts, pick-orange bracts or dark red bracts. Some shrimp plants have variegated foliage. They can be grown as a shrub, or trained into a tree. Justicia brandegeana originates from Mexico. It grows to about 3 feet, but can be maintained smaller with pruning. This plant is quite easy to grow. In it’s native environment it likes part shade. In a home it can tolerate lower light, but you will get the best results with higher amounts of light. Moderate watering is required. This plant likes to dry out between watering. Justicia brandegeana can be kept evenly moist in the summer, but the rest of the time you should let it dry out to prevent root rot. I have grown this with a hygrolon set up, where the soil moisture is kept almost constant and it seems to like that as well. This plant can tolerate lower light levels, though how well depends on the particular cultivar. It grows and flowers the best at full sun when grown in the north. I have grown this on a north facing garden window, though a normal north facing window will not be sufficient for flowering. East/west and south facing windows will produce the best results. The plant will get leggy with lower light, flower less and the bract color will be paler. Here is a shrimp plant flowering on a north facing garden window in the winter time. The shrimp plant can tolerate lower humidity level and some neglect, but it will make it more susceptible to spider mites, aphids and mealy bugs. I use generic potting soil, and add extra per-lite to make it lighter and faster draining. This plant is not very fussy about it’s requirements and quite easy to grow. It’s a moderate feeder, and you can use generic fertilizer spring to fall. The shrimp plant is very easy to propagate though cuttings. Justicia bandegeana is quite easy to grow, flowers constantly if enough light is provided, and has quite intriguing flowers. I do take it outside in the summer months where it gets 5-6 hours of direct sun. Be sure to slowly accustom your plant to higher light levels to avoid sunburn. Pruning is important for maintaining shape. The plant tends to grow long leggy stems, and likes to flower at the tips of those, so pruning will not only keep the shape and size of the plant good, but will also help with having more flowers. The shrimp plant is very easy and fun to grow :). I highly recommend it! Deinostigma tamiana is an extremely cute miniature plant. It flowers most of the year, and if the conditions are right it is never out of bloom. The plant is very tiny, under 3 inches. The flower spike is taller than the plant’s rosette, and the flowers are beautifully displayed. This plant is a gesneriad, an african violet relative, and requires the same culture. This plant does not like excessive heat or cold. The household environment seems to suit it perfectly. Deinostigma tamiana makes a perfect terrarium plant. 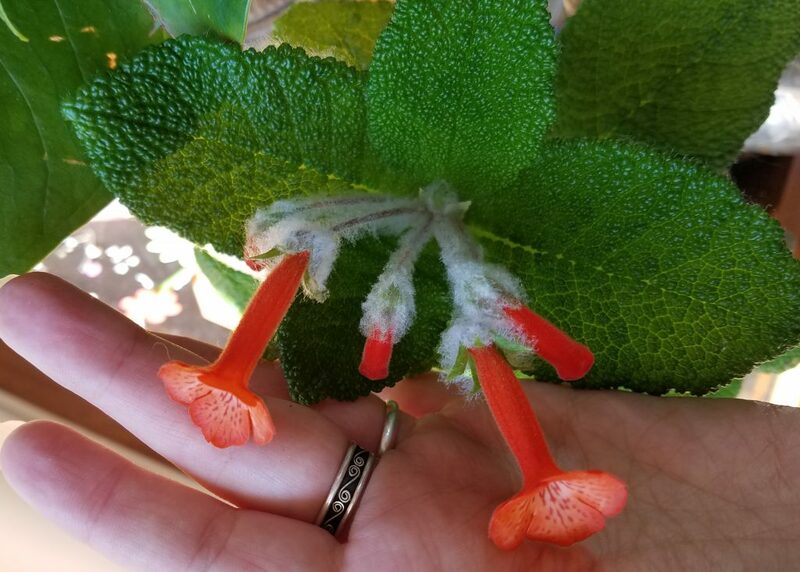 It’s tiny, the flowers are large compared to the plant size, and it does like higher humidity. It really stands out on mossy background. I really like Deinostigma tamiana. It easily forms seed pods that are quite interesting to look at, but they do limit the production of flowers. If you decide to leave the seed pods to mature, the plant will get back into flowering once those are ripe. Occasionally, I would see this plant growing from seed in random pots that were by the parent plant for sometime. You can easily tell it’s a d. tamiana seedling by the leaves. They are positioned like an african violet, but are rounder, smaller and the stems are a bit longer. This plant requires moderate watering. You don’t want to leave it soggy or dry it out. I keep the soil moist at all times (or try to) when the temperature is high, and let it dry out between watering when it’s colder. This plant flourishes in terrarium conditions. You can also use a piece of yarn through the soil to wick water from a humidity tray for example, or a hygrolon set up. Deinostigma tamiana likes shade to part shade. It will benefit from few hours of direct sun, but cannot take afternoon sun. You can have it growing on a north window and it will still look great and flower, but not as much as if it is grown on an east/west window. The leaves will burn on a south window. I do take this plant out in the summer and keep it on the north side of the house, where it gets tons of bright light, but no direct sunlight at all, and it grows very compact as you can see from the picture on the left. This plant likes higher humidity, though it can tolerate lower levels just fine. Humidity tray will help out. Deinostigma tamiana does not like its leaves sprayed. It will do great in a terrarium environment though. You can grow this as an african violet. I use african violet soil, or make my own mix of regular soil, peat moss and per-lite in more or less equal proportions. Primulinas like their soil to be light and aerated. I use african violet fertilizer for this plant. Deinostigma tamiana is a light feeder and if you repot it twice a year you may not have to fertilize it. Nevertheless, I use lower concentration of fertilizer and apply it during the growing season. Deinostigma tamiana is extremely easy to propagate. It will sometimes do that even without your help, and you may find seedlings growing in random pots. You can also propagate this plant by rooting a leaf or a cutting. It’s very easy to propagate. When Deinostigma tamiana forms seeds, it impairs the flowering of the plant and does tend to exhaust itself. Other than that, it’s a heavy blooming plant with cute, beautifully displayed flowers. It’s tiny and easy to grow, and a favorite of mine. Since it’s so easy to propagate, I love adding from it to dish gardens and terrarium gardens. It grows pretty rapidly from seed too, reaching blooming size in several months. I think it might do great potted in other plants pots as well, as a ground cover, if the soil is compatible. Higher humidity and temperature seem to get the flowers a bit discolored. In my experience Deinostigma tamiana likes it cooler, that is under 80°F. candle plant and Many Flowers, as it’s names suggest is an interesting Brazilian species that flowers profusely year-round. It has tropical looking glossy long leaves, and fascinating flowers. The bracts are pale pink when the flower bud is just forming and grow darker and redder as the flower bud matures. You don’t even have to wait for the flower to open, the color and interesting shape all comes from the bracts. The flower itself is deep purple and resembles a closed hibiscus flower. It makes sense since Pavonia multiflora is related to the Hibiscus family. In nature Pavonia multiflora grows in part shade, in warm and humid environment, and grows up to 4-5 feet. Indoors this plant only grows to about 3 feet, and can be maintained smaller with pruning. It likes it warm and humid, though it can tolerate both lower temperature and lower humidity. Very, very easy to grow in my experience! The plant starts blooming when small and never stops. Though it doesn’t show very well on pictures, this plant is exquisitely elegant: thick light in color woody stem, long glossy deep green-laves that are spaced perfectly to reveal clusters of intricate flowers. Medium watering requirements. If the humidity is high enough, Pavonia multiflora can tolerate quite a bit of dryness at the roots. Occasional soaking seems helps. It’s not very needy at all, and when I think of, I’ve been watering it rather erratic, and it can tolerate quite a range, in fact I don’t think it made any difference how I watered it. This plant can tolerate a range of light levels. From part shade to full sun. I do take it outside in the summer, and slowly move it from part-shade to full sun where it gets covered with even more flowers. It will grow at low light levels as well, but the leaves will be spaced out more, and it will not flower as profusely. Indoors, you can grow it on a south/east/west window, and even a north window, though you won’t get as many flowers from it. The picture on the right shows a plant grown on a somewhat smaller east facing window, and as you can see it looks great. Pavonia multiflora likes high humidity and enjoys its leaves being sprayed. Make sure it gets plenty of spraying in the winter time, when the air is drier. Humidity tray can be helpful too, though this plant is not as fussy as other humidity loving plants. If the humidity is not high enough, the leaves slightly curl down at the edges, and become more rigid and brittle. Again, this plant doesn’t really have fussy requirements. I grow mine (I have a few of them lol), in general potting mix with small amount of peat moss (it seems to me right to make the soil a bit acidic, since it’s a hibiscus relative), and quite a bit or per-lite for good drainage. General houseplant fertilizer will do. And as with all plants, I would always recommend fertilizing at at least half strength, more often during active growth, and significantly less if the plant is growing slower (such as winter time). Pavonia multiflora can be propagated through cuttings, as well as seeds. Soft wood cuttings are fairly easy to root, and you can also do air-layering. Pavonia multiflora is not as sensitive to pests as other plants, but it’s still somewhat susceptible to mealy bugs, spider mites and scale. If you miss out and have your plant heavily infested, you can always prune it down to an inch from the soil, clear out the top layer of the soil, maybe even re-pot and shake of the old soil, and spray it with the appropriate pesticide. The plant will re-sprout and resume blooming in a couple of months. It is such a fun plant to have, so easy to grow, and I have no idea why it’s not more popular as a house plant. It’s not an aggressive grower either and you can make arrangements or plant other smaller ground cover plants in the same pot. It’s a cold, but wonderfully sunny day, and despite all the new years partying the night before, I cannot help but enjoy a day filled with flowers. It’s one of the best things about having flowering plants! The outside world might be cold and covered with snow, but as long it’s a sunny day, it’s summer to you! Columnea ‘Melissa’ is an awesome columnea hybrid. There are tons of everblooming columnea hybrids, but this one seems to flower heavily even when it’s a small plant. I got this columnea recently and I couldn’t be happier about it. I love the leaves and I love the flowers which look a lot like columnea ‘lava flow’ (another everblooming hybrid). Pomegranate Nana is always listed as summer blooming, but in my experience this plant is not in bloom for maybe only 2-3 months a year, and I’ve had it for years. I tend to leave it outside until late fall, or until all the leaves fall off. Then in a week or two I bring it inside, where it starts growing again. It’s been a month and a half after “wintering” this plant. Although the leaves haven’t fully grown out yet, there are already flowers on it. In facts, it’s covered with juicy sleek buds. Pavonia multiflora, though still a young, small plant, hasn’t been out of flower since it started blooming this summer. I love this plant. The bracts of the flowers are bright red and look like flowers themselves. When the plant blooms, its a beep purple flower that looks like a closed hibiscus flower.